and tending to her two beloved Irish Setters. She is also the author of Summon the Tiger. The Third Order is a contemporary new adult thriller written by Wendy Sura Thomson. Living and working in New York City was a decidedly different experience for a young woman who had grown up in Fife, Scotland. When Maggie finished her degree in Finance, she had two job offers: one in London and the other in New York. Both career opportunities were attractive, but something about New York swayed her into making a move that her parents had not been thrilled about. There was something infinitely exciting about being on her own after being in the shadow of three protective older brothers and traditionally-minded parents, but even her enthusiasm didn’t help her deal with the occasional interactions with the legendary rude New Yorker. One such confrontation happened in MOMA on a rare, for her, Saturday adventure, but the upsetting incident had a marvelous result. A tall and slender man came up to make sure that she was okay. He was also not a native New Yorker, but his presence in MOMA was auspicious indeed. His name was Ben, and he was finishing a PhD in architecture. What better tour guide could she ask for as she toured the Lily Reich exhibit? They soon had a close and easy friendship which turned into a romance that was everything each of them had ever hoped for. The Third Order is a well-written and fast-paced tale about a young Scotswoman’s romance and marriage to an Ann Arbor, Michigan native, and the tragic accident that would forever change their lives. I was fascinated by the author’s creation of The Third Order, and found Maggie’s struggle to stay free of their clutches to be an enthralling exercise. Thomson’s heroine is a grand character with internal reserves of strength and resilience, and her plot has everything a suspense or action fan could wish for. Travel fiction fans will also love vicariously experiencing Ann Arbor, Fife and Assisi along with Maggie. The Third Order is most highly recommended. 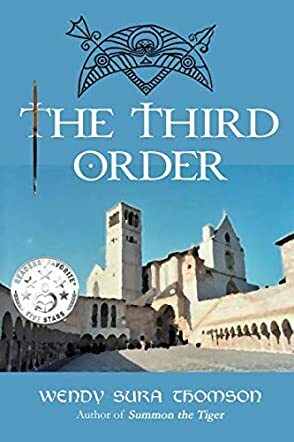 The Third Order by Wendy Sura Thomson is a “chick lit” fiction novel centered around a real-life event, which is the 1997 earthquake in Italy that severely damaged the basilica of St. Francis in Assisi. While a team of experts is evaluating the damage, an aftershock sends part of the dome crashing down, killing two technical experts and two monks in the process. In The Third Order, one of the victims is a visiting American architect, Dr. Ben Tyler, who is in Italy on his honeymoon and was invited to go along. When his Scottish widow, Maggie Fraser, returns to the United States to bury her husband, she finally opens a box containing his effects and discovers something unusual in one of his shoes: a very old metal amulet of Pictish, not Italian, design. Solving the mystery of the amulet and becoming the target of a fringe lay religious order that wants it, hurls Maggie into one adventure after another. Good thing one of her brothers works for MI6 in London! I enjoyed reading The Third Order, which is filled with suspense and drama. Through a flowing, descriptive narrative, Thomson does an excellent job of introducing the characters and setting and unfolding the romance of Ben and Maggie to the reader. The deep and very satisfying love between them becomes real. When tragedy occurs, the reader deeply feels Maggie’s shock and grief. As she returns to her family in Scotland and enlists one of her brothers, a historian, to help solve the mystery of the amulet, the reader is fully engaged in solving this historical puzzle along with them. As one unexpected twist meets another surprise turn, we hang onto our seats to see how it will end. When Ben Tyler and Maggie Fraser first met in New York City, they immediately connected, although in some ways it seemed they had opposite personalities. Ben, from Ann Arbor, Michigan, was working towards his PhD in architecture from Columbia University. Red-headed, beautiful Maggie was from Scotland, and she worked in finance at a large corporation. When tragedy struck, Maggie found herself in possession of a rare item – an ancient, mysterious amulet. In The Third Order, by Wendy Sura Thomson, an intriguing and sometimes dangerous adventure evolves. Maggie is helped by her brothers as they uncover hidden information and attempt to evade unsavory characters. Adding to the riveting mystery are the necessary trips between the United States, Italy, England and Scotland – not to mention a very interesting section from centuries long ago. This book is a page-turner, engaging the reader from the first page to the last. The writer is highly skilled, as she has turned a complex adventure into a smooth-flowing, easy to read story. She has just the right number of characters; each one is described well, and the reader can readily picture each one. Including the family members of Ben and Maggie was a skillful way of further understanding each of their personalities. Readers will also greatly enjoy visiting various cities and learning a few cultural tidbits along the way. Author Wendy Sura Thomson has written a captivating work in The Third Order. This book is unique, with scenes that seem to cover every emotional possibility – love, grief, fear, joy. It is one you will not soon forget!